Keep going! There is no need to clear your garden out or start again from scratch. That old positive saying: "Everyday I'm getting better and better," applies to your no dig garden. By following the guidelines in Build a Vegetable Garden you're away laughing and your garden soil will truly get better and better now. 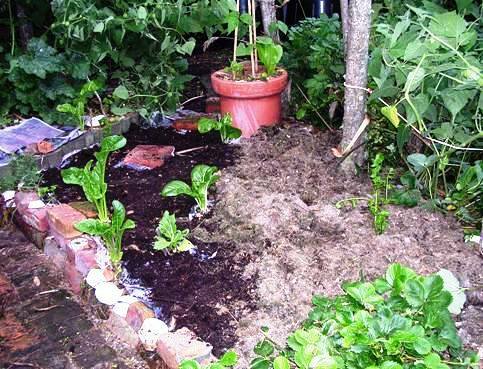 After the first year and a change of seasons, your original layered plot should now be a thriving community, with worms and bugs all actively munching and mixing your layers together. There ARE some challenging gardens built on sand or heavy clay. So actually, truthfully I must admit, it may take some time, like a year or two, before these gardens reach that beautiful deep and rich state... like mine! But keep topping up your gardens as they sink down — the more organic materials you add, the better and deeper you soil condition becomes. At least once a year or each time you re-plant a patch, add some organic material such as compost, grass clippings, leaf mold or suchlike and always mulch around the new plants. The mulch will keep down weeds, retain moisture, keep temperatures even and promote fast, healthy growth. But in your 2nd year no dig, what if. . . ? You started only a few months ago with veggies already growing, and only added newspapers or cardboard layer between rows and covered with straw. Now it looks awful... you've harvested your crops and have dying tomato plants, has-been beans, with tall grass and weeds growing in the gaps? Or, there are still some stubborn or deep rooted weeds, such as ivy, twitch grass, dock, wandering willy and other opportunists lurking around. Or, the original existing ground, usually a lawn, is still quite hard which makes it difficult to use stakes. Or in my case one year, new owners of an old car park over the fence decided to clean up, sending a vast cloud of dried weed seeds via a leaf-blower into my garden. My yelling was in vain due to his earmuffs and noise, not funny! This was a corner of garden I'd just about eaten the last leaves off, so apart from a few straggly greens, I topped up the patch ready to plant some winter veggie seedlings. The first photo shows layers of newspaper going down on top of the previous no dig patch. I also hosed the area first. This photo above shows wet paper covering all the area I wanted to re-plant. This last photo shows that I added some compost and was then covering it with mulch. After that all I needed to do was to make sharp digs with a trowel through the layers and paper, put in a handful of compost or soil and plant seedlings in each hole and water well. 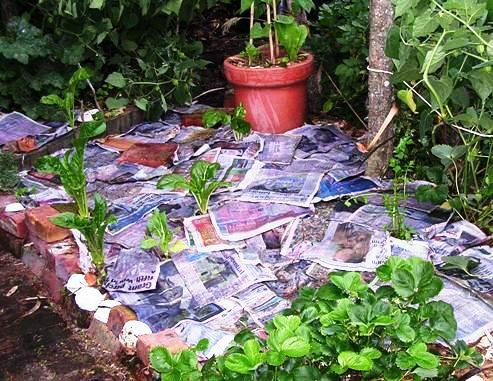 Normally once you've got rid of the weed problem, in future there’s no need to use the paper cover, except over a few weedy spots. This is what I mostly do now and I get lots of new veggie seedlings sprouting up that I can use, and rarely have to pull out a few stray weeds. See Garden Weeds for help if you have weed challenged garden. Spent dead produce, stalks and all, can be bent over or pulled up and left on the ground, or put in compost if they are tough, thick old sods. No need to mow the area, although you can sort out any large uneven clumps. Cover the lot with new layers with or without paper first. It will all soften and decay, incorporating into the layers of your old soil. Or you can plant a 'green manure' cover crop. It's a good idea to ask locally what are the best green manure crops to grow in your area; but some universally popular seeds are rye, clover and lupin. These plants help the soil with nitrogen and in the spring before they flower and seed, you just chop them down or bend them, then bury them under 5 or so layers of paper then some compost and mulch and there you have a great start for the summer growing season. This is a particularly good idea for old compacted lawn or yard areas that still need a bit of TLC. Let the worms and other organisms do the work; they are trojans at aerating and enriching soil. 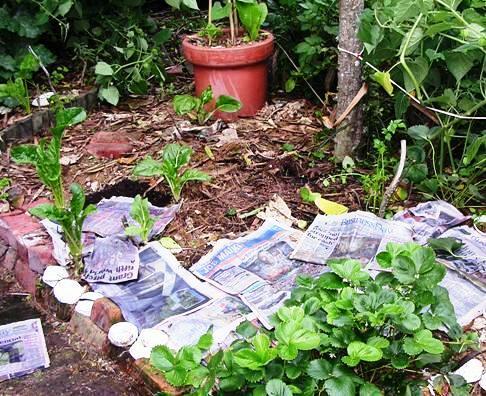 If you do leave your veggie plots to lie fallow over winter, when spring comes you can keep building up the garden with layers of handy material right on top of your old plots. You can throw the kitchen scraps on, some paper layers, cut grass, compost—really whatever is available, you'll truly find you and your soil will get better, better and BETTER. Once you get the hang of how to continue to build up and maintain your no till layers, it's just like another day at the office for naturally knowing what to do. Here are some forum post extracts from other gardeners'. . .
Kiwi George says. . . . Depending on the depth of "lovely black stuff" you have developed from Year 1, just repeat the process minus the newspaper as the first run will have killed the weeds. 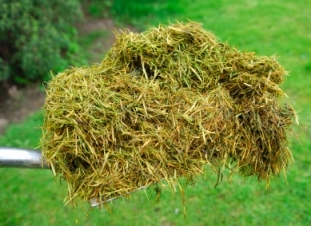 If there are still some weeds remaining, they should pull out easily so recycle them through your compost heap. Then just layer the straw, manure, seaweed etc and leave it to the worms to do their thing. I have found a rain cover to be beneficial as I am in a wet cold area. After 5 years of No-Dig I have turned "impossible Clay" into 50cm of humus, (thanks worms!!). I have so much bulk they are overflowing the retaining boards so I dig out about a cubic metre from each bed and store it in rubbish bags for use as top dressing for my flower beds and use as potting up mix. No-Dig is perfect and I could have saved the energy used for many years of double digging for more enjoyable activities. Allan Roberts says. . . . I am a bit disabled and now cannot dig; a friend said I could still grow veg with raised plots. A builder mate of mine gave me a load of old floorboards which I made into large containers then filled them with anything compostable. There is a stable near me that is only too happy to give away manure to anyone that wants it. I did not plant anything for the first year as I wanted it all to rot down, the second year I grew so much veg I was giving it away. All I do now is keep topping up the containers. It has worked out so easy I wish I had done this years ago; just think of all that hard digging it would have saved me.